FLORIDA KEYS (CBSMiami) – Calling all South Florida fishermen who want to take part in an upcoming Lionfish Derby. Lionfish, which have no natural reef predators except man, are wrecking ecological chaos because they eat important indigenous fish such as Grouper and Snapper. Derbies, such as the one being held Saturday, Sept. 8th, are organized to try and thin out the growing lionfish population. A U.S. Geological Survey map dating back to 2000 shows the lionfish beginning to appear along the Eastern seaboard. By 2009, the entire Caribbean and Florida Keys became saturated. 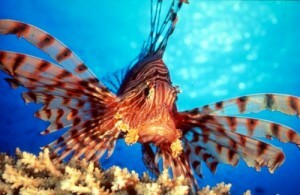 Lionfish can now be found as far west as Louisiana and as far south as Venezuela. This lionfish derby will be held Sept. 8th at Coconuts Restaurant, located at mile marker 100 in Key Largo. Derby divers can compete for more than $3,000 in prize money while helping preserve Florida Keys habitats and ecosystems. Teams of up to four people can register. Early registration fee is $100 and includes one pair of puncture-resistant gloves per team.